Peterson Toscano » Join Me in Phoenix! Photo courtesy of TransMentors International. 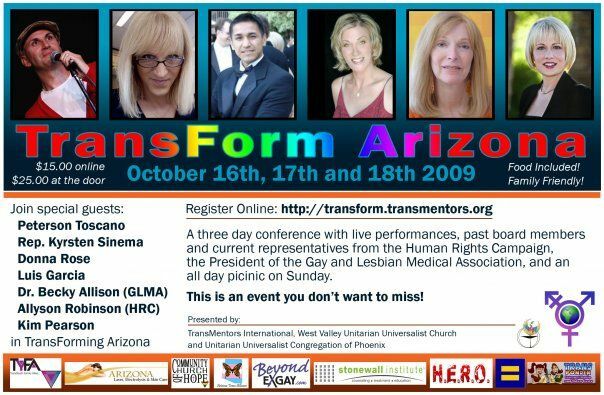 TransMentors International has announced that it will hold its Transform Arizona conference October 16-18, 2009 at the Unitarian Universalist Congregation of Phoenix located at 4027 E. Lincoln Drive in Paradise Valley (map). The purpose of this conference is to educate and raise awareness within the LGB community and the public at large of Transgender people. This event will include speakers, entertainment and workshops. The workshops will cover a wide range of topics, from faith-based support, mentoring, legal issues, and health concerns, among many others. A full listing of available workshops is available on the TMII website. The event features world renowned performance artist Peterson Toscano, known for his stage performances dealing with various LGBT issues. Allyson Robinson of HRC and Donna Rose, former board member of HRC will be speaking at the event. Dr. Becky Allison, President of the Gay and Lesbian Medical Association, will also offer a presentation. Saturday Dinner Guest Speaker will be Arizona State Representative Kyrsten Sinema. Local leaders in the Trans Community will be on hand to discuss how using the trans experience can further the rights of the entire community as each segment is interdependent and interconnected. Registration is necessary. See website for details and to register. 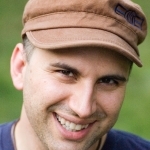 Note: Peterson Toscano’s performances are free to the public. TransMentors International (TMII, pronounced “Timmy”) is a non-profit organization which provides aid, support and assistance to Trans-identified individuals. The mission is to raise awareness and effect a positive change in issues which are specific to the Trans community. TMII addresses issues such as personal transition support, housing, employment and faith support.